Always happy and smiling, while remaining accurate and punctual. That’s Iva. Iva, the woman who loves to dance with numbers. These are the sides of Iva that we, as her colleagues at eWay-CRM, know very well. How did you get into the world of finance? And how long have you been working for eWay-CRM? Take it from the start. From the very beginning! That means at least ten years. I was already here when eWay-CRM was taking off! And when did you start with finance? I’ve been working in this field for a very long time! I finished high school in ‘94 and started working in accounting in ‘95. I completed my tax expert exam in 2004 and took off, but I’ve basically been working in the field since high school. So, you must have a close relationship with eWay-CRM. And what problems have you come across since then? Of course, there were certain things. But rather than me having to deal with them, it was the other way around – my colleagues who are programmers got to ask me about the details and principals of our accounting systems as well as the very rules of accounting. How things work and why we do this or use that. Even though they have been working with finance for a long time themselves and they know a lot about accounting, they are still not the ‘tax people’. How do you personally use eWay-CRM? I mainly put documents in it, and I change the statuses of documents. However, a lot of things between eWay-CRM and our accounting system have been automated lately. For example, after payment, the document status changes itself. Things we actually have to do in eWay-CRM manually are just a few. What else do you personally use in eWay-CRM? Time sheets are a perfect resource for salaries. I also keep myself up-to-date regarding Projects. Despite not doing them myself, I maintain an overview on the development and the progress of individual activities. Can eWay-CRM get any better for you? I am unable to say that in a complex way, but from my point of view, eWay-CRM has a lot of automated processes, which is very convenient. What has been saving us hours of work each month is that eWay-CRM sends invoices to clients automatically and reminds them of overdue payments. Once a quarter, I take out reports to check the status of orders, new projects, and the effectivity of individual managers. It helps me to see the bigger picture and to predict our growth. So, I understand that accounting is your life. I studied at Business Academy, then Management and Economy at University, but I had also Marketing there, and I found out that for me, it’s too much talk and no action. Come on, we are having such a nice talk at the moment! Sure, but when there is for example a meeting, I always think – I could have finished so much work instead! Okay, numbers are faster than people, that’s true. I have always liked numbers for their speed. I finished studying after getting a bachelor’s degree and started working. My first position was in an advertising agency in 2001. That means you did advertising? In 2004, I became a certified Tax Advisor and started working here. Have you always been such an action person? I never wanted to phone it in. And how about some free time? You love numbers, do you enjoy Sudoku then? I used to, but working with numbers all the time, I don’t seek them in my free time anymore. What kind of dancing do you like? But the dancing partners are also important, and boys are rarely good dancers! I also used to like discos, but not anymore. I also like skiing, cycling, roller skating, playing golf, and badminton, but only recreationally. But my favorite hobby is dancing. Yes, I dance in my free time and at work with numbers. 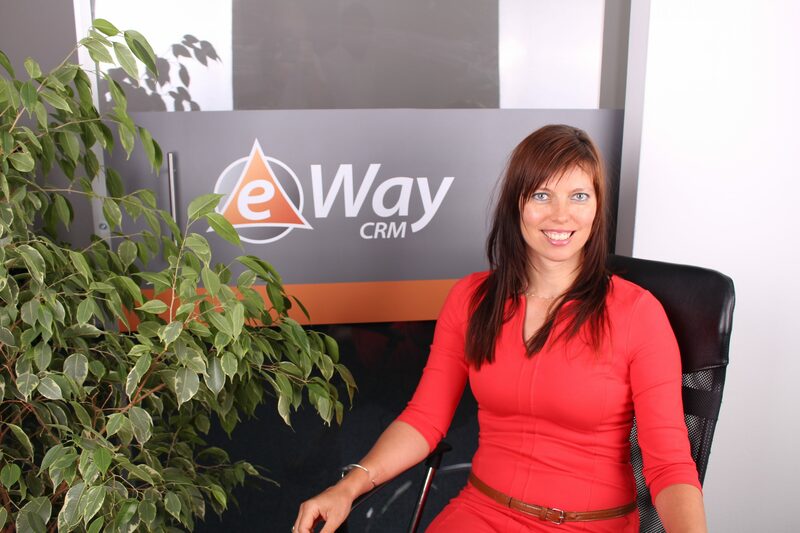 Iva, the Financial Director of eWay-CRM has been with us for more than ten years.